You are here: Home » Blog » Who are Shephard Building LTD? Who are Shephard Building LTD? Your home should be a haven of comfort and security. The one place where you can kick back and be yourself, relax, and entertain friends. A place to truly be proud of. As the old saying goes, ‘an Englishman’s home is his castle’. So, however big or small your home is – whether it’s extra space you need, renovation or a complete rebuild – the fact is that when you employ a firm of builders it’s an important choice to make, because you are trusting them with the care of somewhere that is special to you. In the past building firms have had some bad press for substandard work and unreliable service. Our aim is to change all that and that’s why we pride ourselves on offering a reassuringly different approach to building. So who are Shephard Building LTD? We are a well-respected firm of builders which has been established in Loughborough for many years. The work we have done throughout the East Midlands has left hundreds of happy customers in its wake and the results we have achieved throughout our building history is testament to the effort and attention to detail that we put into every project we do. Our high standards don’t stop there either because a top priority for us is also excellent customer service. From your very first free consultation with us, you’ll be able to see what makes us stand out from the rest. You will be given a senior point of contact who will see your project through from beginning to end. We also ensure good project management to make sure that the job is completed on time and to budget. Our quotations are detailed, with no hidden extra costs sprung on you further down the line. And, throughout the whole process we will liaise with all parties involved, such as architects, building control officers and structural engineers, saving you the time and effort of doing it yourself. Our dedicated in-house team can also take on most aspects of work, from the build itself through to the plumbing, electrics and even the decorating. Our experience, integrity and our professionalism, is re-enforced by our membership of the Federation of Master Builders, because all FMB members are thoroughly vetted and undergo periodic site inspections to ensure the highest of standards. Added to this, all of our staff are highly qualified to City & Guilds or NVQ standard, as well as being DBS checked. But, what makes us truly stand out is the fact that we offer service with a smile. Our friendly team get an awful lot of job satisfaction out of what they do and they enjoy their work. We believe that a happy team makes for excellent results and the jobs we have completed speak for themselves. 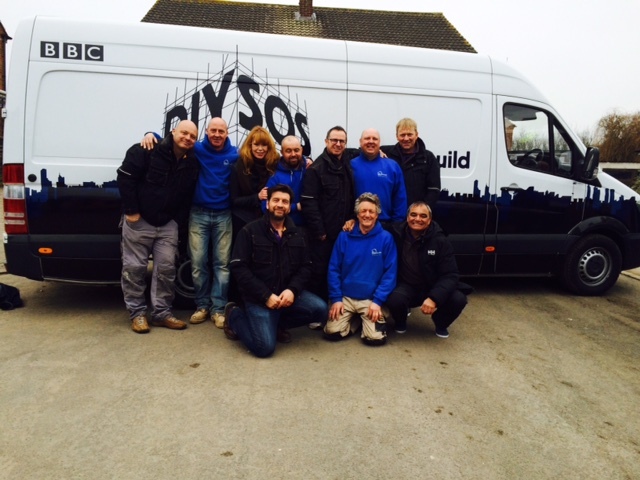 One project we particularly enjoyed recently was the opportunity to lend a helping hand to a Loughborough family that was featured on DIY SOS: The Big Build. The Corns family had battled a series of devastating illnesses, not to mention tragedy in their lives, and they deserved a break. This heart-warming story goes to show how there are still businesses out there who are prepared to go that extra mile to help those who need it. If you would like to find out more about the building work and improvements we can make to your home, why not contact us for a quote today. We’d love to hear from you.